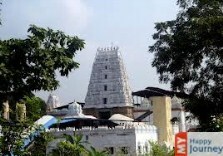 Well known as a temple destination, the city of Bhadrachalam lies in Andhra Pradesh. A dazzling city, where the splendid River Godavari turns along the stretch of sand, is said to be holy because it is believed that various events of the legendry Ramayana have taken place on the land of Bhadrachalam. This city is famous among devotees, as it is considered to be Lord Rama and goddess Sita’s earthly abode. The town derives its name from the word “Bhadragi” which literally means “Mountain of Bhadra”. Bhadra was a child who was born to Menaka and Meru after a blessing and was Lord Rama’s great devotee. After Ayodhya, which is the birth place of Rama, the city of Bhadrachalam is regarded as an important place by the followers of Lord Rama. Weather of the city remains pleasant during winters, which attracts a large number of devotees. People visit the holy city in summer season to enjoy the celebrations of Ramanavami, which is an important festival of the region. Various festive celebrations draw a number of pilgrims towards the land of Lord Rama. This splendid city, with a large number of temples dedicated to different gods witnesses huge rush of devotees throughout the year. A trip to Bhadrachalam as well as an overnight stay on the banks of Godavari River will always be a memorable experience. A voyage through the holy river will make the trip even more exciting. So plan a trip and experience the greenery and natural warmth of this pious city.